"Not synchronized" appears when a managed node is not sychronized with the deployment manager (dmgr). In this example, the AppSrv01Node01 node is not synchronized. Typically, the node can be sychronized by selecting the node and then select Sychronize or Full Resynchronize. Refer to how to synchronize a node in WebSphere to understand the difference betweenSychronize and Full Resynchronize. When the status of a node is "Not synchronized", ensure the clock of the dmgr is showing the same date and time as the clock of the node server. It will be ideal for both the dmgr and node server to use the same NTP server. If a change was made to the node or dmgr, restart the node or dmgr. When an attempt is made to sychronize, the following event should be in the dmgr SystemOut.log. The following events should be in the application server syncNode.log. On the application server, check the was_home/AppServer/profiles/your_profile/logs/nodeagent/SystemOut.log for exceptions. In this example, the SystemOut.log contains an exception. These exceptions do not let you know the cause of the problem. They simply let you know that there is a problem. The FFDC log may let you know the cause of the problem. On the application server, check the was_home/AppServer/profiles/your_profile/logs/ffdc/nodeagent_xxxxxxxx_yy_mm_dd_hh_mm_ss.xxxxxxxxxxxxxxxx.txt files to see if you can spot the cause of the problem. In this example, one of the FFDC logs identifies that the cause of the problem is that the application server cannot create a SOAP connection to the dmgr on port 8879 due to some issue with SSL certifcate. ADMC0016E: The system cannot create a SOAP connector to connect to host example.com at port 8879. One possible issue is that WebSphere may be configured to use your own keystore or truststore, and there is some issue with your keystore or truststore. 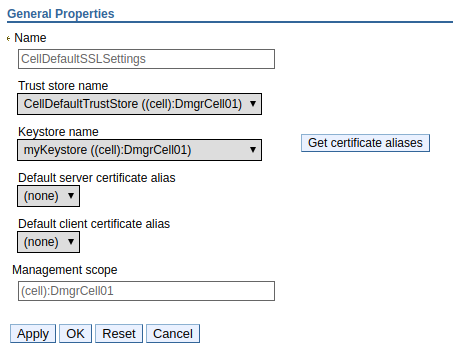 In this example, the cell is configured to use "myKeystore". In this example, after the issue with the keystore was resolved, and the dmgr was restarted, the node could again be synchronized.